Show me the Money: how much is each premier league position worth? With less than a quarter of the season remaining, most EPL clubs will finish within a couple of places of their current league position. For some clubs this could mean the difference between survival or sinking into the Championship; for others, swimming with the big fish in the Champions League or the smaller shoals of the Europa League. For the rest the consequences are less dramatic. While fans chew at their finger nails, club owners and directors will be busy assessing the financial consequences of each permutation as they plan for next season. A significant proportion of each club's revenue next year will depend on their final league position in May. The difference between 8th and 10th may not seem particularly important, but how much are these few extra places worth in terms of the cash prizes on offer? More generally, what is the total amount a club can expect to bank as a direct consequence of their final league position? 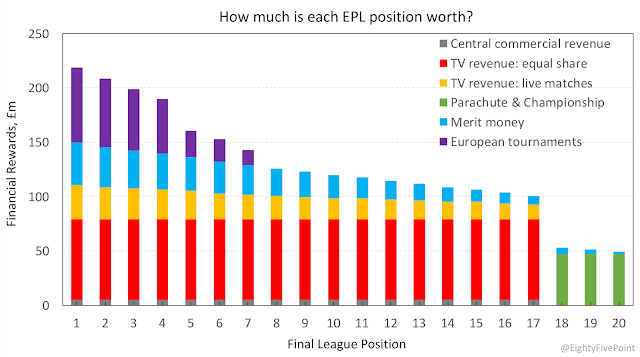 TV revenue - equal share: A team that avoids relegation immediately receives a hefty prize: their equal share of the EPL broadcasting revenue for the following season. Last season each EPL team received £74m: £35m from the sale of domestic broadcasting rights and £39m from the sale of overseas rights. The amount received by premier league clubs in the 2018/19 season should be roughly similar. TV revenue - live matches: EPL clubs also receive an income - known as the "facility fee" - proportional to the number of their matches that are broadcast live. For example, 29 of Liverpool's 38 league matches last season were shown live, for which they received £34m (about £1.2m per match). Only 8 of Sunderland's matches were televised and so they received £12.4m (which is the minimum facility fee that a club can receive). Teams that finish higher in the league tend to appear in more live matches the following season, although the "Big 6" are always well covered. There's little evidence that a club's costs to host a live game are anything near as large as the fee received (plus the away team also receives the fee), so this source of income can be viewed as another position-dependent prize. Commercial payments: Clubs also receive an equal share of the EPL's central commercial activities, of which sponsorship is the largest component. In recent seasons this has amounted to about £5m per club. Parachute payments: Relegated clubs will continue to receive a share of the TV income paid to those that remain in the Premier League. In the first season after relegation, a club will receive 55% of the TV money that they would have received in the EPL, and -- assuming they do not immediately win promotion -- 45% the season after that. Furthermore, they can expect to receive about £6.5m per season for competing in the Championship. 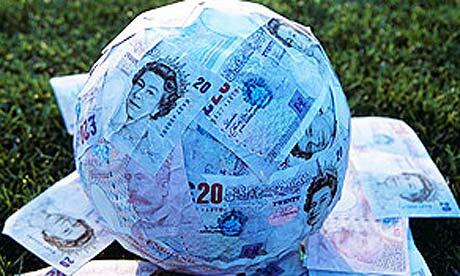 Merit money: Clubs also receive prize money in direct proportion to their final league position, known as "merit money". For every place higher that a club finishes, they receive an extra £1.9m. Last season, Sunderland - who finished bottom - received just £1.9m; title winners Chelsea received £39m, twenty times more than Sunderland. European competition: Qualifying for the Champions League is highly lucrative. Clubs are paid about £11.3m just for participating in the group stage, and receive a substantial bonus for each point they accumulate. The knockout rounds come with further rewards; the club that wins the Champions League is guaranteed at least £45m in prize money. The prizes are substantially lower for the Europa League, but not insignificant: £2.3m for participating in the group stage, up to a total of £12m for winning the tournament outright. Furthermore, each club that participates in the Champions or Europa Leagues also receives a portion of UEFA's TV income (the 'market pool'). The exact allocation is based on a formula that accounts for the size of the domestic TV audience in a club's country, their domestic league position, and how far the club progresses in the tournament. English clubs in the Champions League will receive about £125m to be shared amongst themselves this season; those participating in the Europa League will share roughly £40m. Based on the historical performance of English clubs, whoever qualifies for the Champions League next season can expect to make at least £50m from the tournament, while a club that qualifies for the Europa League can expect to make about £15m. The stacked bar chart below shows an estimate of the total financial reward that follows from finishing in a given position in the Premier League this season. 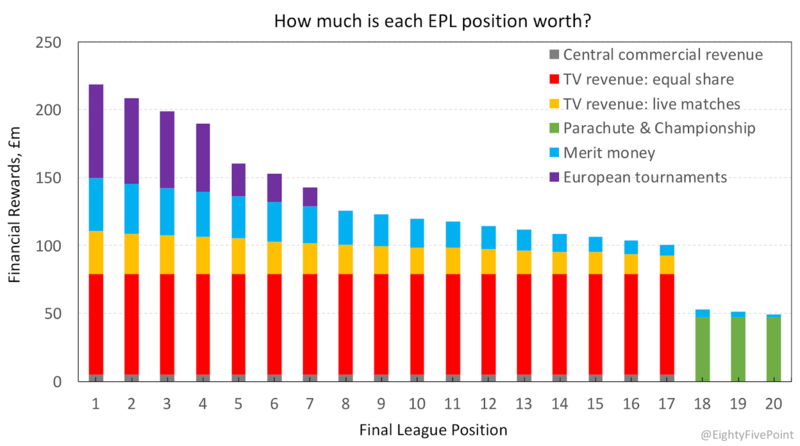 Each colour represents a component of the reward: the equal share of broadcasting revenue (red); matches broadcast live (yellow); commercial revenue (grey); merit money (light blue); parachute payments and Championship income (green); and the expected revenue from participation in European competitions (dark blue). The latter is determined using the historical performance of English teams in European tournaments to calculate their expected progress and therefore prize money. 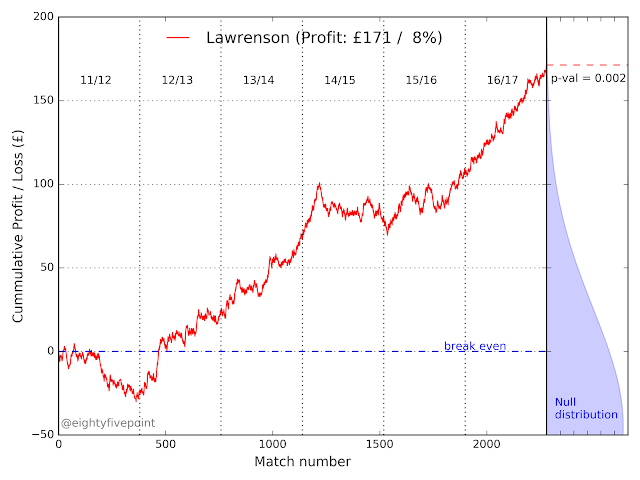 Where necessary I have assumed that the available prize money next season will be the same as this season. This may underestimate the rewards of competing in Europe next season as UEFA have announced that there will be significant chances to their financial distribution system in the 2018/19 tournament (Total Sportek have a nice summary of 2017/18 UEFA prize money here). Figure 1: Estimated total prize money associated with finishing in a given position in the EPL this season, broken down by source. The EPL title comes with a £219m prize, of which only £39m (18%) is the direct reward, or 'merit money' (light blue bars), for finishing first. £79m, just over a third, comes from the equal-share portion of the TV and commercial income (red & grey bars), and another £32m for matches televised live the following season (yellow bars). The remainder comes from the expected windfall of playing in the Champions League next season. The difference in prize money between the top four is mostly driven by the manner in which UEFA distributes TV income for the Champions League, which is, in part, dependent on league position. The team that finishes fourth can expect to receive about £20m less from UEFA than the champions. However, there is an even bigger gap between fourth and fifth place, highlighting the financial cost of missing out on the Champions League altogether. The club finishing in fifth will receive £30m less than the fourth-placed club, mostly due to the lower expected revenue from the Europa League. Prize money drops off slowly from 8th to 17th place at a rate of £3m per place: the team that finishes 8th receives £25m more than the team that finishes 17th. Parachute payments and Championship income ensure that relegated teams receive at least £47m next season, but they will still receive less than half the amount received by the team finishing 17th. From a purely financial perspective, owners of clubs outside the Big 6 may not care where they finish in the league, so long as it's not in the bottom three places. Should Champions League revenue be distributed more broadly? Relegation aside, the Champions League represents the biggest distortion of the rewards on offer, creating an artificial gulf between fourth and fifth place. Under the current system, EPL clubs that qualify for the Champions League each receive a portion of the English share of UEFA's broadcasting revenue (a total of £165m this season) which itself is determined by the size of the UK audience. But the Champions League is watched by fans of all clubs; it is, after all, the pinnacle of European football. Should UEFA's TV income belong solely to the clubs that participate in the tournament? In the last fifteen seasons, clubs outside the big six have qualified for a place in the ECL on only two occasions: Leicester in 2016 and Everton in 2005. Otherwise, the two Manchester teams, Liverpool, Chelsea, Arsenal and, more recently, Spurs have gobbled up the lions share of the EPL's revenue from one of sport's most moneyed tournaments. The situation is even more extreme in Scotland, where Celtic have been the sole beneficiary for the last six seasons. A redistribution of UEFA's broadcasting revenue to ensure that all EPL (and SPL) clubs receive a taste -- it doesn't have to be an equal portion -- could be an effective means of narrowing the financial schism between the top clubs and the rest of the league. It may, in the long run, make for a more consistently competitive league. Thanks to David Shaw for comments. Amusingly, this means that it is financially beneficially to be the sole remaining representative of a domestic league, as early as possible in a European tournament. UEFA state: "A new four-pillar financial distribution system (starting fee, performance in the competition, individual club coefficient and market pool) will see sporting performances better rewarded, while market pool share will decrease." I can't find any information as to what this new system will be, though. League position in the previous season is actually a good indicator of the number of matches a club can expect to be shown live the following season. Note that Europa League revenue is less for the 6th and 7th place due to the decreased likelihood of these teams qualifying for the league stage (based on past performances of English clubs in the qualifiers). Figure 1 probably underestimates this gap as club-specific sponsorship deals often increase in value with participation in the ECL (or decrease should a team fail to qualify). UEFA does make 'solidarity payments' to professional clubs that did not participate in their competitions, but these tend to be insignificantly small relative to the other EPL prizes.